Saint Christopher, the protector of safe travel. 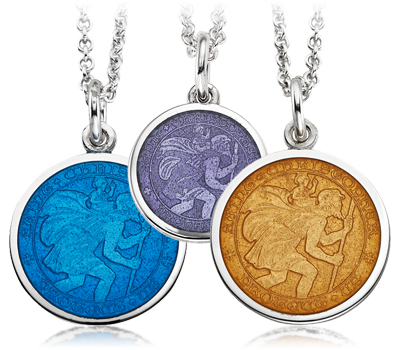 St. Christopher medals beautifully crafted in sterling silver and colored enamel. X-Small, $55. Small, $65. Medium, $80. Large, $90. X-Large, $105. Shown as pendants or can be worn as a charm on a bracelet.